“Stunning . . . A beautiful, sprawling, and generous book. Jansma is a brilliantly talented writer, but he also has a unique insight into what friends mean to one another, and what it means to be part of a city in which you never quite belong, but can’t quite bring yourself to leave. It’s a heartfelt novel, tender and painful and cathartic all at once, and even if the characters belong to New York, the story belongs to us all.” —NPR December, 2008. A heavy snowstorm is blowing through Manhattan and the economy is on the brink of collapse, but none of that matters to a handful of guests at a posh holiday party. Five years after their college graduation, the fiercely devoted friends at the heart of this richly absorbing novel remain as inseparable as ever: editor and social butterfly Sara Sherman, her troubled astronomer boyfriend George Murphy, loudmouth poet Jacob Blaumann, classics major turned investment banker William Cho, and Irene Richmond, an enchanting artist with an inscrutable past. Amid cheerful revelry and free-flowing champagne, the friends toast themselves and the new year ahead—a year that holds many surprises in store. They must navigate ever-shifting relationships with the city and with one another, determined to push onward in pursuit of their precarious dreams. And when a devastating blow brings their momentum to a halt, the group is forced to reexamine their aspirations and chart new paths through unexpected losses. Kristopher Jansma’s award-winning debut novel, The Unchangeable Spots of Leopards, was praised for its “wry humor” and “charmingly unreliable narrator” in The New Yorker and hailed as “F. Scott Fitzgerald meets Wes Anderson” by The Village Voice. 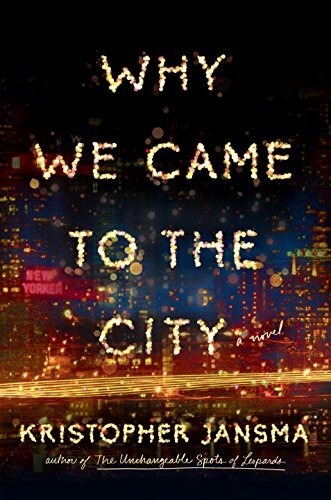 In Why We Came to the City, Jansma offers an unforgettable exploration of friendships forged in the fires of ambition, passion, hope, and love. This glittering story of a generation coming of age is a sweeping, poignant triumph.